Waterstone was purchased in November, 2011 from a Real Estate Investment Trust. SCP partnered with a private-fund investor to acquire the asset. The property is very well located in the master-planned community of Murrieta, located in southern Riverside County near the San Diego County border. The property is adjacent to single family homes, neighborhood retail, and office uses. It features low density with an expansive campus, good floor plans and nice amenities. It was built in 1990. Waterstone has a unique place in the local market, in that its lower density offers an open, park-like feel that no other property has. However, the amenity and unit finishes needed upgrading. Also, the property would benefit from the addition of garages and resident storage, which most of the competitive properties in the area offer. SCP embarked upon a repositioning plan which incorporated upgrades to all of these elements. Early indications are that these improvements will be embraced by the market. The upgrades to this apartment community are now completed. 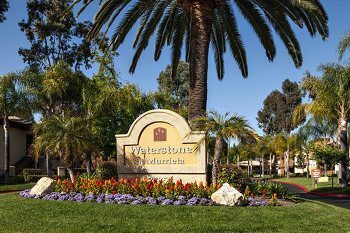 Waterstone at Murrieta was sold in 2014.